Nothing brings people together quite like the Olympics, and as the games draw near the big names have teamed up again for some friendly competition. 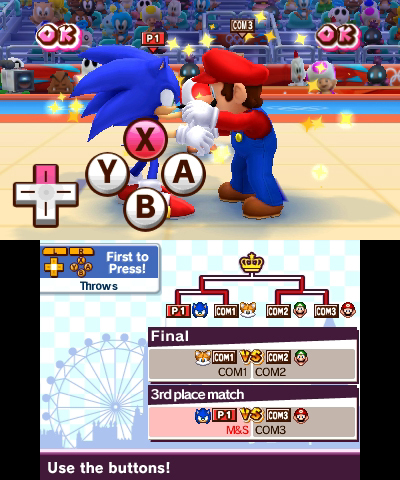 Mario & Sonic at the London 2012 Olympic Games is the third title in the series, which takes a total of 20 characters from the SEGA/Nintendo franchises through a myriad of Olympic-based mini-games. As with the previous titles, the gameplay focuses on taking part in various Olympics-ish events; although there are some, we dare say, that wouldn’t exactly classify as competitive-level sport (I’m looking at you ‘Grabbing a drink during the marathon’ and ‘Breathing during the pentathlon’ events). 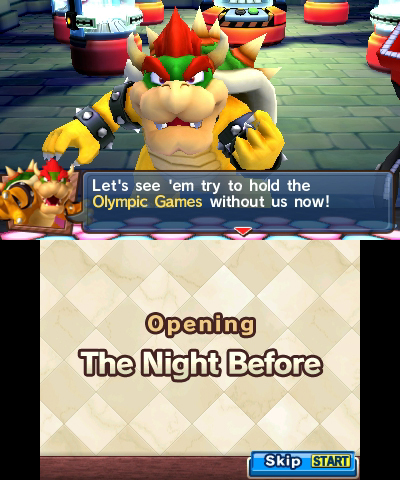 We tried out the 3DS version which has 57 events that are accessible through single player, multiplayer or the Olympic-centric storyline. 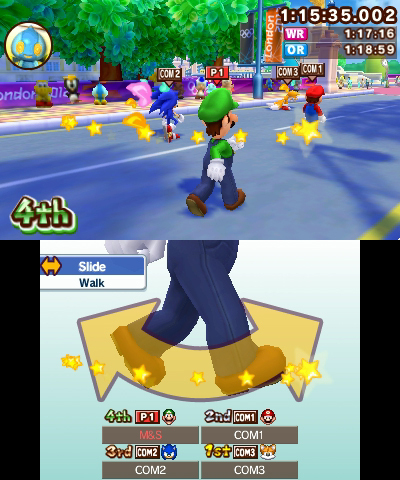 By comparison the Wii version acts more as a party game, making up for a lack of story with more events, Party Mode and “Dream Events” which take the player to location from past Mario & Sonic at the Olympics games. Price: Now available for on Nintendo Wii and 3DS for $39.99 at EB Games and JB Hifi. In Mario & Sonic at the London 2012 Olympic Games the story is as illogical as one would expect for a gaming-icon sporting title; the famous heroes Mario and Sonic have been invited to the London 2012 Olympic games with all their good-guy friends. Unfortunately poor Bowser and Dr. Eggman/Robotnik have been excluded for some unknown reason, and are set on taking their revenge by cancelling the games with fog machines and strange fog-dopplegangers. 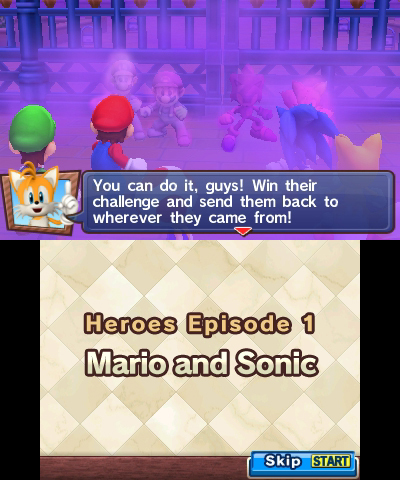 Naturally it is up to Mario, Sonic and the gang to put a stop to the havoc and save the Olympic games by… competing in Olympic events? See, it makes perfect sense. In story mode you are taken through episodes which focus on the various hero and villain teams in their quest to save/stop the London Olympics. The cut scenes introducing the ‘reason’ behind every mini-game can be a bit tedious considering the characters have only so many iconic sounds to make, but they are interesting enough for the first play through, after which you’re given the option to skip through. Following the explanatory cut scenes, you compete against your adversaries in various mini-games to further your cause. Overall the story mode organises the mini-game mayhem quite well, running you through a variety of game types, encouraging use of all the characters and showing off some the significant landmarks of London. 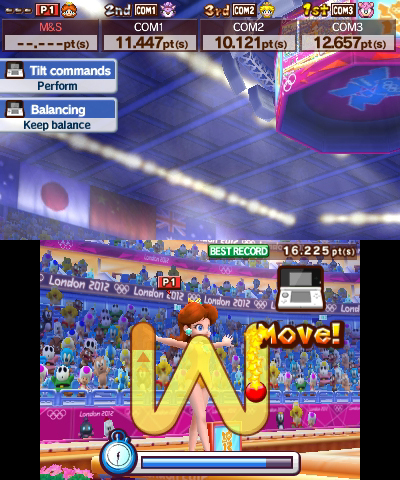 In addition to the story the Olympic events can be played in the singleplayer mode through highlight matches (one event – one round) or medley matches (back to back events, aiming for a final high score). There’s even a wide rage of medley options allowing you to play through extra fast, create a party mix, make your own medley or even trade them. A Multiplayer mode is also available for you to challenge up to three friends through local and download play. Challengers: Shadow, Yoshi, Silver, & Bowser Jr (okay now I know they’re just making this up). It’s a bit of a shame that fans are limited in their ability to play as their characters of choice, but on a positive note it does encourage the use of some of the lesser-loved individuals from either series. It also conveniently gives Nintendo and SEGA a way of keeping Luigi and Tails away from the Rhythmic Rhythm event, but in my opinion you just gotta let them express themselves – however that may be. The heart of the title is the Olympic-style mini-games, and in that respect Mario & Sonic at the London 2012 Olympic Games gives 110%. The events make use of almost every feature of the 3DS, except ironically the 3D itself; the analog stick, buttons, shoulder buttons, d-pad, touchscreen, gyroscope and microphone are all used in a variety of ways and with different combinations. It’s certainly interesting and challenging; if you ever want to give your 3DS a work out, this title is sure to do the trick. For the most part the experiences are enjoyable and challenging, with each event condescend down into simple, bite-sized sporting pieces that are great for when you’re on the go. One moment you’ll be in a quick-time event to get the edge in a Judo match, next you’re angling your console to perform a flip in the gymnastics routine and then suddenly swiping your stylus in time to a walking beat. While the events are mostly fun, there are some that are not only unpleasant to play but are just an embarrassment to the game as a whole. Who thought it was a good idea to make you yell at the console in order to lift weights? Or that blowing into the microphone while simultaneously controlling a sailboat would be fun? (The sailing event actually goes on for long enough to make you dizzy from lack of breathing – smart move). Thankfully once played these events are easy enough to avoid, yet it is strange that there is no way to see the controls before starting. That is to say, if you’re sitting on the train about to play a quick game, you won’t know whether you’ll be using buttons, stylus, or say yelling at your 3DS like a crazy person (until it’s too late!). And finally, what would the Olympics be with out the medals? In Mario & Sonic at the London 2012 Olympic Games there is a sea of collectibles available in Record Log. Players can check out their stats for all games types, their ‘Top 5’ or keep track of the rankings online. In terms of collectables, you can view your many sparkling medals and even buy badges to display next to your name (on the console and online). The badges themselves can be bought with ‘tickets’ from playing events, and featuring gaming characters, expressions, foods, animals, instruments and more. The stats and collectables are a nice addition, adding a little something to aim to earn through the mini-games. 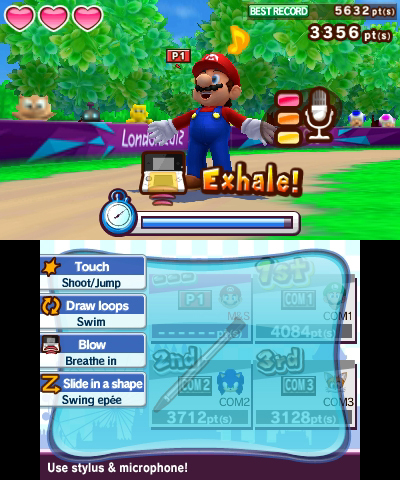 Overall, Mario & Sonic at the London 2012 Olympic Games is a solid title filled with (mostly) well-made mini-games optimized for some quick fun. It is great for some fast fun when you’re waiting, although there are some events you may need to avoid in public (unless of course you’re happy scaring people away). For any parents wanting to spur their child’s interest in the Olympics, this is defiantly a fun title to keep the older kids interested – but adults will also be kept entertained by the wide range of challenges the game has to offer. With the London Olympics just around the corner, the game is now available on both the Wii and 3DS for only $39.99 at EB Games and JB Hifi. While the collector’s editions are a bit harder to find, it’s still an impressive swag and also retailing now for just $39.99 in stores. 7 – Good. Entertaining but is held back by a couple of flaws. It will certainly capture its intended audience but it won’t appeal to everyone.